I know it’s easier to just pray the obligatory prayers and rush out of the mosque, however, when we realise the rewards we’re missing from not praying these Sunnah prayers, we won’t leave them. Over the years I learned there’s only ONE way of getting yourself to pray these Sunnah prayers constantly: Get into the habit of praying them! Soon they’ll become part and parcel of your Salah. Again, it’s easier to rush out of Salah to our busy lives, but honestly, how long does it take to recite the supplications after Salah? (Answer: 5-7 minutes!). If you’re not sure what I’m referring to, you may find the supplications here. Nowadays you’ll find pocket notebooks/or phone applications with these supplications. Again, get into the habit of reciting them daily after each Salah and they’ll become part of your Salah experience. These are a beautiful set of duas/remembrances from the Sunnah of Prophet Muhammad which he used to say before sunrise and before sunset. They are true stress relievers, and energy boosters, and never fail to make my day/evening feel blessed. [You can find the duas here]. Hamdulillah, during Ramadan we have the wonderful Taraweeh prayers to attend. These are of course part of the Night prayer or tahajjud of the Night. If you’re new to night prayer or don’t pray it constantly during the year, make sure you attend Taraweeh prayers each and every night, and give yourself a ‘no-excuse’ policy. Continue to pray them for the entire 30 days; that will set you on better footing to offer the Night Prayer after Ramadan inshaAllah. If you want a Muslim’s secret to a productive day, it is these 2 rak’ahs; known as Duha prayer which you may pray at any time after sunrise, all the way till before the sun reaches its zenith (around 30 minutes before Dhuhur). The reward of this prayer is similar to giving charity on behalf of every bone in your body, and the energy and buzz you feel during the day is amazing. You just had a long day, and you’re super tired. You climb into bed and you want to hit the sack… but wait! Before you do, can you give yourself just 10 more minutes to recite the supplications before sleep? That’s all. Try them to have the most beautiful sleep ever and wake up for Fajr easily inshaAllah. Notice: I said here recite one hour of Quran each day and not one juz’ or one surah. The amount of Quran you read here is not as important as the quality of your understanding. If you spend one hour reciting one verse but understand it fully, that’s more important and beneficial than reciting lots of the Quran at breakneck speed and not understanding a word. 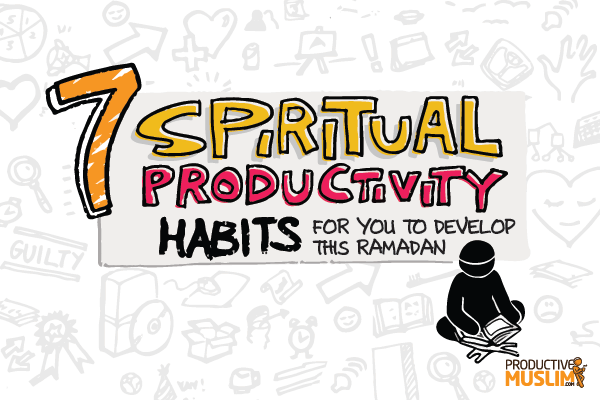 So there you go, 7 spiritually productive habits you can develop this Ramadan starting TODAY! 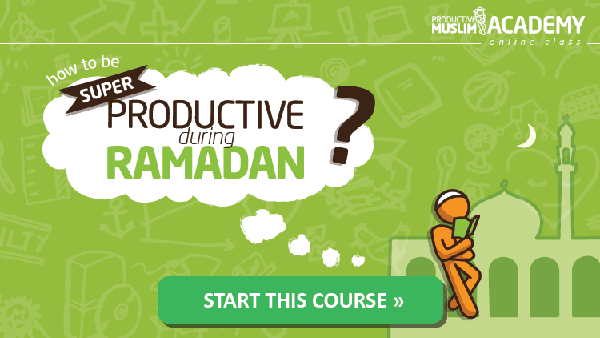 Don’t forget to share with us some of your Ramadan habits below!